Providing continued education for child care providers. The Child Care Education and Training Program provides continued education trainings for directors, assistant directors, center teachers, center staff, parents, and family child care providers. We offer four specific training series that are designed for particular age groups, as well as general trainings related to child development. Throughout the year the Child Care Education and Training Program in both Dothan and Montgomery offer special training events that include, Sensational Saturday Child Care Conference, Director's Conference, Supporting Children with Special Needs Conference, Week of the Young Child Teacher Training and Children's Concerts and Alabama Early Learning Guidelines Course. To learn more about our four series, click the links below. The Montgomery and Dothan Child Care Resource Lending Libraries, in partnership with the Department of Human Resources, promote quality child care by providing information, education, and assistance to child care providers and directors, parents, and community members. Both are comprehensive lending libraries that offer children’s books, curriculum books for teachers, resource kits, video and audio tapes, and periodicals available for check out. You are invited to arrange a tour of our libraries at your convenience. For information on how to become a library patron or library hours, please call or email Claire Wallace for the Montgomery location and Christine Gordon for the Dothan location. To e-mail, click on the name. For a complete list of Die Cuts in the Montgomery Resource Library location, click here. For a complete list of Die Cuts in the Dothan Resource Library location, click here. Family Guidance Center’s Child Care Education and Training Program celebrated Week of the Young Child with our Spirit of Excellence Awards Luncheon – Celebrating Child Care Leaders on Wednesday, April 26, 2017. We were honored to present Debbie Bailey, Director of Bell Road Preschool, and Clara Robertson, Family Child Care Provider, with the Dedication to Children Award. Geraldine Hill, Center Director of Central Alabama OIC, was presented with the Lifetime Achievement Award. 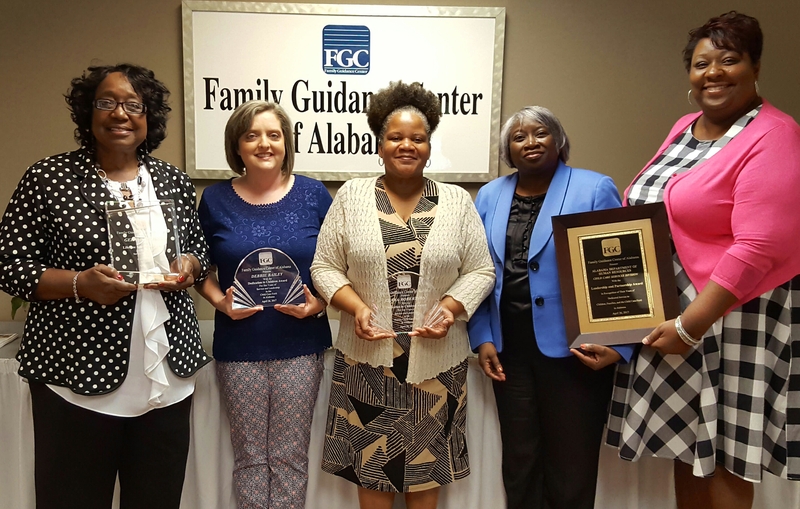 In addition, the Child Care Services Division of the Alabama Department of Human Resources was presented with the Leadership and Partnership Award.